CETI is working together with WebExercises® to create a library of specialized cancer exercise program videos for you to use to create workouts and instructions for your clients, and to provide guidance on how to use their tools to help make your individualized programming easier. Using WebExercises® to provide specific guidance to your clients for an individualized cancer recovery program is easy. Here we will provide an overview of the process of conducting an assessment of your client, identifying the areas that need help, and then using the clinically accepted exercises and stretched in the WebExercises library to easily provide detailed guidance to your clients with a cancer exercise program. The first step that needs to be taken prior to any individual cancer exercise program, is conducting a comprehensive postural assessment. It is through this process that we are able to identify muscle imbalances that may be causing faulty biomechanics and increasing the risk of degenerative conditions such as arthritis. Often times your clients will complain of pain in a particular body part or region that may be due to an ongoing muscle spasm that causes ischemia to that area. This may be remedied in your cancer exercise program by stretching the affected muscle and strengthening it’s antagonist. Upper-crossed syndrome (UCS) is also referred to as proximal or shoulder girdle crossed syndrome (figure 4.2a; Janda 1988). In UCS, tightness of the upper trapezius and levator scapula on the dorsal side crosses with tightness of the pectoralis major and minor. Weakness of the deep cervical flexors ventrally crosses with weakness of the middle and lower trapezius. This pattern of imbalance creates joint dysfunction, particularly at the atlanto-occipital joint, C4-C5 segment, cervicothoracic joint, glenohumeral joint, and T4-T5 segment. Janda noted that these focal areas of stress within the spine correspond to transitional zones in which neighboring vertebrae change in morphology. Specific postural changes are seen in UCS, including forward head posture, increased cervical lordosis and thoracic kyphosis, elevated and protracted shoulders, and rotation or abduction and winging of the scapulae. These postural changes decrease glenohumeral stability as the glenoid fossa becomes more vertical due to serratus anterior weakness leading to abduction, rotation, and winging of the scapulae. This loss of stability requires the levator scapula and upper trapezius to increase activation to maintain glenohumeral centration (Janda 1988). Janda identified two subtypes of LCS: A and B. Patients with LCS type A use more hip flexion and extension movement for mobility; their standing posture demonstrates an anterior pelvic tilt with slight hip flexion and knee flexion. These individuals compensate with a hyperlordosis limited to the lumbar spine and with a hyperkyphosis in the upper lumbar and thoracolumbar segments. Layer syndrome is a combination of both upper and lower crossed syndromes (Figure 4-7). There is marked impairment of motor regulation that has increased over a period of time. Patients with layer syndrome have a poorer prognosis than those with isolated UCS or LCS due to the long-standing dysfunction. This pattern is often seen in older adults and in patients suffering unsuccessful surgery for herniated nucleus pulposus (HNP). For example, when you have a client who presents with upper-crossed syndrome, the focus is usually on stretching the pectoral muscles and strengthening the opposing back muscles. If your client has an anteriorly-tilted pelvis, the focus is usually on stretching the hip flexors and strengthening the hip extensors. We each have our own arsenal of exercises; yoga, Pilates, aquatics, and personal training, but wouldn’t it be nice to have some more variety? 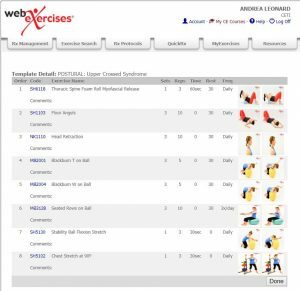 WebExercises® gives you the ability to quickly and easily create concise and personalized exercise programs, selecting from over 3,000 clinically accepted exercises and stretches from all body regions. Instruction sheets can be printed or delivered by email. You have the ability to look up exercises by body part/region, body position, movement, level of difficulty, and equipment. 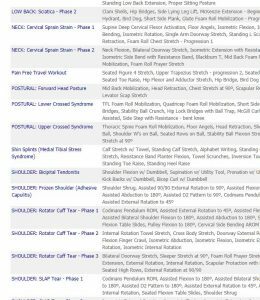 You can also look up exercises based on injuries/syndromes. You can then choose Upper Crossed Syndrome. 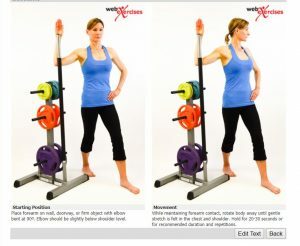 Click on the heading and choose from the exercises. You will be able to create a workout folder for your client that includes pictures and videos and you can personalize the descriptions if you would like. You can even add your own exercises! Stay tuned for CETI exercise availability for specific cancer exercises that address the muscle changes/removal that can occur during cancer treatment and recovery. CETI will be adding videos and classifying them to provide you with a easy-to-use, comprehensive library to help with cancer exercise program development.